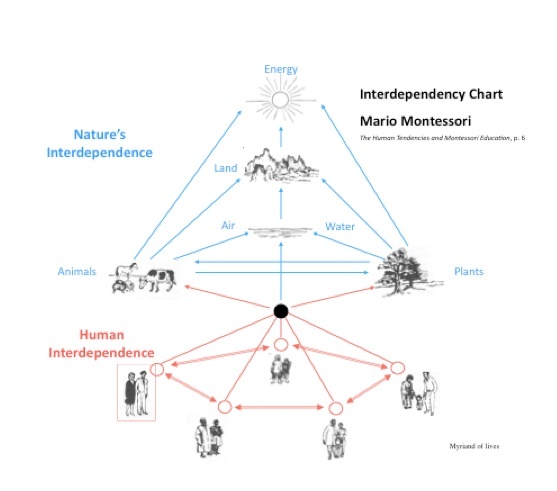 In preparation for the 2017 Montessori Congress in Prague, MISP, in collaboration with NAMTA and MMUN, is exploring a web approach for the Adolescent Summits with the intention of holding seven interrelated summits corresponding to the seven active agents of Montessori’s Interdependency Chart. The summits will be implemented in seven cities around the world. The web of life as the organizing principle ties all summits together. The unified results of the summits will be presented in Prague. By converging nature’s unity of life on earth, which is fundamental to Montessori’s view of modern science, the social drive of the adolescent and their need to contribute to humanity through meaningful work, we anticipate a dynamic leap in the Montessori movement for a more peaceful world. We are conducting this survey to gain a general knowledge of the exciting environmental and social work being done at Montessori adolescent programs around the world and to determine which seven cities/schools will serve as the hosts for the seven interdependent summits in early 2017, with organizational support from MISP. Each local ecological summit may host other international Montessori schools to participate, and then meet with all summit participants in Prague. We appreciate your willingness to complete this ten minute survey. Please feel free to contact elizabeth@constructingpeace.org with any questions. Please spread the word! “Girona was amazing.” Those were the words of one our students in the Cleveland airport upon return from the 2016 Adolescent Summit. Our experience was from the adolescent’s true tendencies to want to belong, to deepen, to find out about people who are different than themselves. The home stays jelled. And after a several mile guided eco-tour along the Ter River, part of a confluence of four rives that wind through the 7th century streets of Girona on Wednesday morning, there was a marked change in the mood as if a mystical sidelight overcame the walk. It was as if all of the facts and figures regarding tree siphoning, river flow, fish ladders over serial dams, foresting after deforesting, eco-systems vs. human infrastructure seemed to make their demands on the river over time and damage the river. The walk was still beautiful and the river alluring, yet it was an awakening. At the end of the day Wednesday they had begun writing their nature manifestos in four groups–one for Chihuahua, one for Barcelona, one for Cleveland–and then the fourth was a mixture of all three locations for the International manifesto. The effort was single minded. The four manifestos were read in the Mayor’s historical council room, a small inside gathering place with guilded chairs on the the perimeter like a medieval court. What a stage set! The manifestos were cemented by significant hours of dialogue and back and forth. The whole group seemed united in body and spirit. Everyone felt they fulfilled a purpose in an international setting, that would come back home–in our case, a whole Montessori school pledge to eco-living.